The popular street dumplings. Just master the technique and you can use endless combination of ingredients (stuffing) to suit your palate. Mix the maida (refined flour) and salt and knead to a stiff dough with water. Just before you are finishing making the dough, add 1 tablespoon cooking oil (preferably refined oil) and knead for half a minute. Cover with a damp cloth and keep aside for 15 minutes. Take the boiled chicken, grind in a mixer. In the ground chicken, add oyster sauce, sesame oil, soy sauce, pepper powder, grated ginger, grated garlic, chopped coriander leaves, chopped spring onion stems, sugar and salt. Mix well. Take a pan. Put 1 tablespoon olive oil. Heat the oil for two minutes. Now add the Chicken mixture to it and stir for two to three minutes. Set aside. Let the mixture cool down for 10 minutes. Divide dough into sixteen small portions. Shape them into balls and roll the dough thin (you can use the remaining cooking oil while rolling the dough) . Put a teaspoon of the filling in the middle. Bring all edges together to the centre, making small tight pleats. Pinch and twist the pleats to ensure that the momo is closed tightly. Heat water in a pan (water should be around 1 inch height). Arrange the bamboo basket with food paper on the compartments. Apply a little olive oil on the momos and place them over the food paper. Cover and place the bamboo steamer over the hot water and steam for 15-20 minutes or till done. Take the bamboo steamer out. Uncover it. 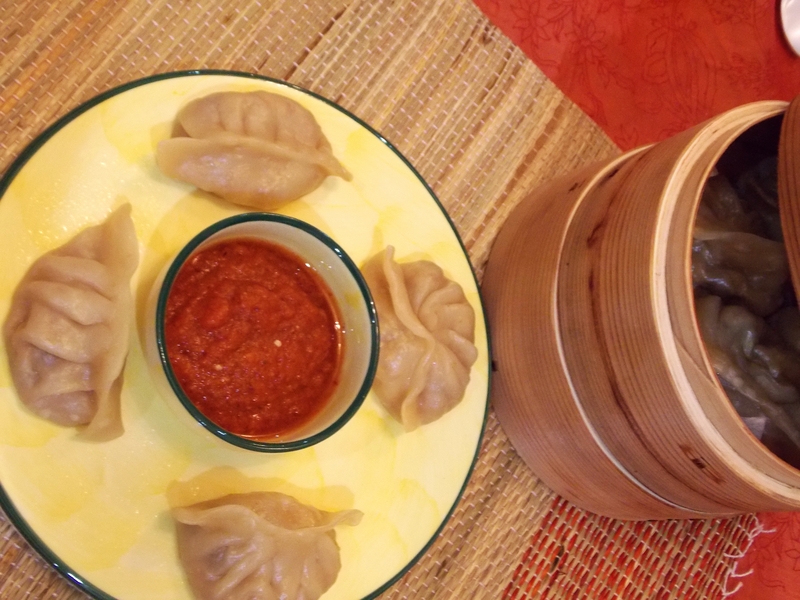 Serve the momos hot with Tomato, Chilli and Garlic sauce.